Parts of the Waldorf Astoria's interior has been calendared for a hearing at which LPC will considering designating it a city landmark. MIDTOWN EAST — The interior of the Waldorf Astoria Hotel is one step closer to being preserved as a historical landmark, amid plans by its owner to turn most of the hotel rooms into condominiums. The Landmarks Preservation Commission on Tuesday voted unanimously to consider designating the portions of the ground, first, second, and third floors of the hotel as a city landmark, citing the importance of the Waldorf to the city’s cultural and architectural history, according to a spokeswoman for the agency. 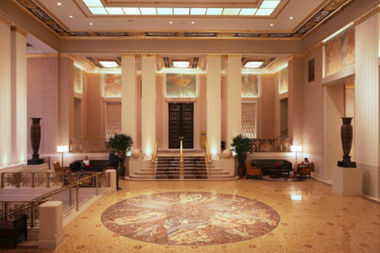 “The Waldorf is notable and unique for containing some of the finest and most culturally significant Art Deco interiors in New York City,” the commission wrote in a statement of significance, the document summing up a the case for landmarking a given site. ► Fixtures and decorations of these interiors, including but not limited to the wall surfaces, murals, mirrors, ceiling surfaces and floor surfaces, exterior elevator doors and grilles, chandeliers, lighting fixtures, attached furnishings, doors, and metalwork. The push for landmarking came amid plans by the hotel’s owner, the Chinese insurance giant Anbang, to turn much of the hotel into private residences. Anbang, which bought the hotel in 2014, announced this summer it intended to transform 1,100 of its 1,413 rooms into condos, according to a report in Bloomberg News. Joshua Berkman, a spokesman for Anbang with the PR firm BerlinRosen, said on Tuesday the company fully supports any move to designate the hotel’s interior as a landmark. The decision to calendar the hotel’s interior came as welcome news to preservationist Simeon Bankoff, executive director of the Historic Districts Council, who hailed it as a step toward recognizing a space that represents a key part of high society in New York. Because interiors tend to see more alteration over time than building exteriors, and because they are typically less accessible to the public than building exteriors, they often face a more uphill battle to get designation. But in the past year several notable interiors, including the Waldorf Astoria and the glassy, mirrored interior of the Ambassador Grill at One UN New York Hotel, have gotten the nod from the LPC and are now set to be considered.